Sikes & Nancy is, in a word, incredible. This one-man performance, masterfully and often astonishingly delivered by James Swanton, was originally an 1869 Public Reading by Charles Dickens himself. The author's own performances were known for their intense physicality, where his pulse would almost double from 72 to 124. It is said that after his readings, he would lie on a sofa exhausted, unable to utter a word. Having watched James Swanton at the Mercury Theatre last night, I can well believe it. On a black stage with just a spotlight and six wooden chairs for company, Swanton morphs into a range of characters to tell the dark tale of Sikes and Nancy and their eventual demise. We see Nancy refuse to betray her beloved Bill to Oliver Twist’s saviour Mr Brownlow; she pays the ultimate price anyway when the 'housebreaker' bludgeons her to death and then inadvertently hangs himself. Swanton's portrayal of all these characters - as well as a rather Gollum-like Fagin - is outstanding, switching between them without skipping so much as a beat. His performance was all the more remarkable given the fact that the sounds of the Seventies were being pumped through from the performance in the main auditorium. 'I Will Survive' and 'Brown Girl in the Ring' were incongruous additions to his dramatic tale (and very distracting at the beginning for the audience), but his professionalism in light of this was extremely impressive. 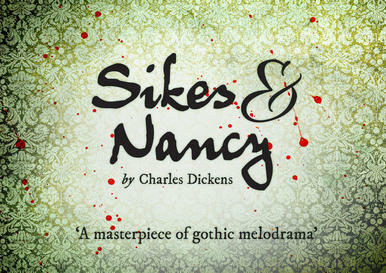 Sikes & Nancy offers a real instruction into the darker side of Dickens, which is in turns affecting, grisly and utterly gripping. And the simple production - directed by Colchester's own Jimmy Jewell - gives you a historical insight into how 19th century theatregoers would have enjoyed the author's work. You've only got two more opportunities to watch Sikes & Nancy at the Mercury Theatre - drop all your plans and go and see it. It truly is outstanding.